For their final Season Denève and the RSNO have been celebrating the works of Claude Debussy, to mark the 150th anniversary of the French composer’s birth in 2012 and in May Chandos releases the double CD recording by Denève and the RSNO of his major orchestral works. 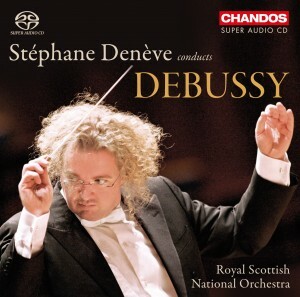 THE RSNO has immortalised its recent live survey of Debussy’s orchestral works on this exceptional double disc, and the care and attention that has gone into making these recordings is nothing short of perfection. There’s always a danger that the science of the studio can result in sterility, but not here. Stephane Deneve, in what is effectively his most tangible legacy on leaving the RSNO this month, has pulled out of the bag a stream of deliciously coloured performances of the attitudinal Images, the mellifluous Nocturnes, the fascinating twists and turns of Jeux, the immortal L’apres-midi d’un faune, La mer and other jewels such as the jaunty Marche ecossaise. Debussy is portrayed in all his infectious guises. Truly one for the collection.